Post Installation Care of Turfgrass | Maple Leaf Lawncare Inc. 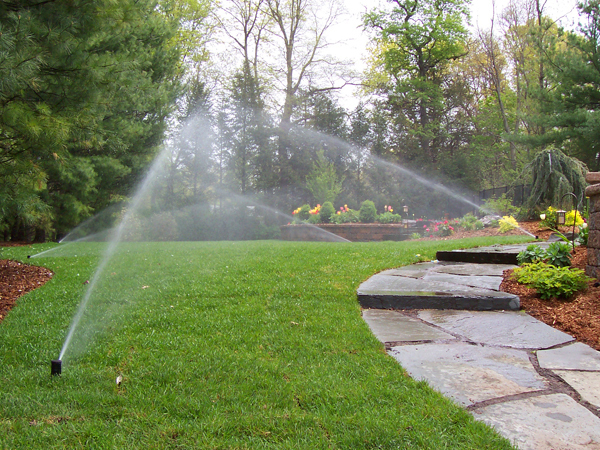 The type and quantity of fertilizer required for your lawn will depend on your grass variety. Cool and warm season grasses vary as do their nutrient requirements. Check with your Extension Service, local nursery or lawn and garden professional to determine what type of fertilizer is best for your lawn. The turfgrass can be mowed when it is rooted. Be sure to remove no more than 1/3 of the grass blade. The actual height of the cut varies depending on weather the grass is cool or warm season and the type of grass. Keep your mower blades sharp. Dull blades tear the grass blade instead of cutting it cleanly. These small rips in the turfgrass tissue can cause the grass to lsoe more water, increase irrigation needs, create stress, and make the lawn more vulnerable to diseases. Leave grass clippings. Contrary to popular belief, they do not cause thatch. (Thatch usually occurs only when turf is excessively fertilized and soil is compacted, cool and moist.) If you follow the 1/3 cutting rule grass clippings won’t smother the grass plants. They will dry out and work their way down to the soil surface. These clippings return nutrients to the soil, resulting in less fertilizer use. They also cool the soil and help it retain water. Thatch is a layer of dead and decomposing plant tissue that forms above the soil. A thin 1/2 inch layer is beneficial to a lawn. It protects plant crowns and reduces compaction. But if the layer gets too think, water, air and fertilizer can’t get through to the soil and grass roots. Runoff increases and dry spots appear. Or when it’s wet, the thatch can remain saturated and suffocate roots. Thatch usually occurs on turf that has been heavily fertilized, and is most common on poorly drained, compacted and acidic soils. Some species of lawn grasses are more prone to thatch problems than others. Sever thatch problems left unattended may eventually require the use of a dethatching machine. To prevent or minimize thatch problems, core aeration is an option depending on your situation. Core aerators punch small holes in the lawn allowing air and moisture to penetrate through the holes. It is most effective in late summer when temperatures are starting to cool and the soil is only slightly moist. After aeration, leave the soil cores on the surface to dry. Then rake them to distribute the soil down through the grass to mix with and dilute the thatch. The mixing action fo core aeration is similar to that provided by earthworms. Core aeration can also help increase water infiltration on compacted soils. Contract with a local landscape company for dethatching or core aeration service or check with your local equipment rental center.